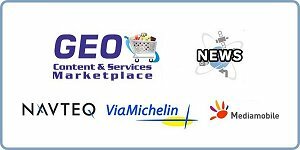 PocketGPSWorld.com are delighted to have been chosen as media sponsor for the Geo Content and Services Marketplace Exhibition in Paris, in December. The trend in the GPS navigation market is now moving far beyond driving from A to B. As explained recently by Andr� Malm, senior analyst at research firm Berg Insight: "Mobile operators and service providers are now accelerating their efforts to create differentiated navigation experiences with unique local content to compete against free services". Content is the keyword of the Geo Content and Services Marketplace, a business to business event to be held on December 7, 2010 at the Radisson Hotel CDG Airport in Paris. Located in the vicinity of the Paris Charles de Gaulle Airport, the Geo Content and Services Marketplace allows navigation professionals to visit the event for the day flying in and out from across Europe. Alexandre Saltiel, co-founder at GPS Business News, the trade publication that organize the event said, "We built it from the ground up with the idea of fostering business relationships between stakeholders: content vendors on the one hand and buyers of navigation providers on the other; this is a real mix between exhibition and networking". Leading content companies NAVTEQ, ViaMichelin and Mediamobile have endorsed the event as sponsors.